♥ Quick Blade Change - We provide 11 blades in all including one installation and 10 for additional replacement, which is more than most of the market. It also greatly prolongs the service life of utility knives. In addition, there is a quick-change blade mechanism, you can just press the button of blade head with your thumb and pull or push the blade with the other hand, making it easy to replace the blade without any tools. ♥ Sturdy Body - Folding utility knife has durable ergonomic handle and sharp SK5 blade of high quality. The non-slip and effortless handle is made of blue aluminum alloy and ABS material, and feel good in the hand. Heavy-duty SK5 stainless steel blades are high hardness, strong wear and rust resistance. ♥ Use Safety -The multi-purpose pocket knife has the security lock-back design, which safely locks the blade in place without any movement when fully opening or closing. The blade also has a transparent protective cover to avoid accidental scratches. ♥ Pocket Size - The box cutter with a stainless steel belt clip is compact and lightweight, it fits for your pocket and allows you to carry it wherever you go. The folding utility knife is a practical gadget for outdoor, traveling or daily use. 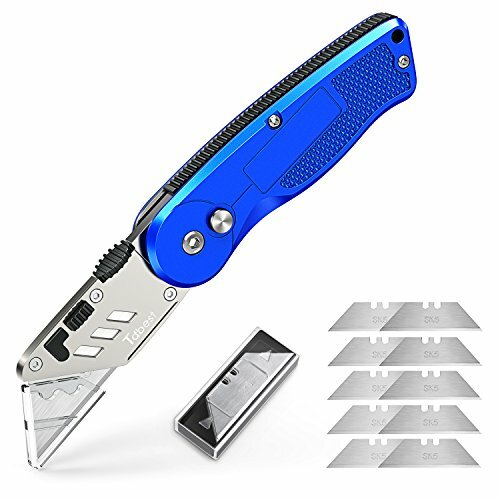 ♥ Widely Used - This portable folding knife can easily cut a variety of materials, such as general cutting of cartons, ropes, carpets, plastics, leather, wallpapers, aluminum sheet, etc.